Make money. Save money. Start a business. Simple. This is an extremely simplistic view of your financial lifestyle. If you’re anything like me, then seeing things boiled down to their simplest terms is the best way to look at subjects. Most complex topics are built off of simpler ideas. An example is how computers operate off of an organized system of 1’s and 0’s. 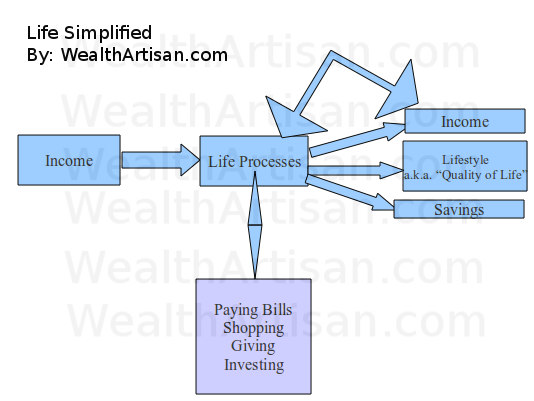 This chart shows how your income passes through your "life" process and gets converted into different outputs. Your finances can be more simply boiled down to an income stream (or multiple streams if you have diversified income) that makes financial decisions with certain end results. Looking at the above chart I made for you, this is clearly seen. Your income stream goes into your “Life” process and a bunch of things happen. What are some things that happen? You pay your electric, water, cable, phone, internet, and insurance bills. You buy some food and a new winter coat because it is snowing outside. You give some money to a church or local charity. You put some money into your Roth IRA, or TFSA (Cheers, Kevin!). You buy some dividend paying stocks. And, you put a little into savings. There are a lot of other things that can happen during this “Life” process, and these are the things that define your life. These are the things that make your life different from your neighbors, or my life different from yours. By passing your income through this “Life” process, you transform your income into outputs. These outputs are your lifestyle (or quality of life), hopefully some more income, and savings. Please Note: Generally, quality of life is inversely related to the other two outputs. That means that a higher quality of life usually means less savings and less income generated from your income. There can be many more output possibilities but most can crudely be lumped into one of these categories. The good news in all of this is that you have a whole lot of control on what happens in that “life” box, which directly affects the outputs. You also have a little control over that first income box too. Many people might argue this, but you have complete control your phone bill, cable bill, etc. We will discuss this a bit more in the next section. Please Note: The income output has an arrow that points back into the life box. This is another example of how you can control your income. Of course, with good news, there is bad news. Most people exhibit very little control over their life process, and use the word “cannot.” Some might say that they can’t live without cable, or cell phones, etc. Will controlling those processes lower your “quality of life” output? Absolutely, but it will also increase your “savings” or “income” outputs. For some people, this is a worthwhile trade-off, but others don’t want to lower that quality of life output. Ironically, by lowering your quality of life, you can actually increase your income by investing properly and end up having an even better quality of life. The trade-off is that it takes a bit of time and pain. No one ever said it would be easy, but taking a more macro look at your life might help you get your processes into better control. Leave us a comment, subscribe to our feed, and be sure to keep checking back! What processes are you taking control over, do you lower your quality of life to increase your other outputs? Great explanation Timothy. Quality of Life: Treating life more like a crockpot and less like a microwave will always put one ahead of the crowd. This attitude of “Have to have, now” has been in existence since the 2nd WW and we need to retreat back into the world of our great grandparents and pay as you go. I like the crockpot analogy. There is a lot to be learned from the Depression Era generations. I often try to read up on how things were done just to get more ideas. It’s too bad how quickly we’ve lost the philosophies that built this country so well. I have never made so little money, yet been so happy. I have more control over my income than most. As teacher, I volunteer to teach summer school and during my conference period. My lifestyle is very low key. Our expenses are relatively low, because we downsized 13 years ago, entertainment consist of occasional movies and dinners out. Our dinners are always under $20-25 except for an occasional splurge (birthdays & anniversaries). My only extravagance is travel, most of which is almost free because of frequent flier miles. I think I live very well. That is what I think is so interesting about finances, especially frugality. Quality of life can be high at any income level. But as you move up into higher income levels you just get more access to “things” and the size of things can get bigger. A person on $30,000 with a small car, small house, family, and steady job can have just as happy a life as a top executive at a large company. A lot of people probably succumb to “excusitis” — “I have to pay for this bill” or various things like that. As time goes by, you realize that you have more control than you believe; it’s all about what you’re willing to exercise control over and what you’re willing to leave to fate. Accept responsibility, take control, make good choices, and enjoy the results. It really is that simple, it just requires work rather than setting your finances on “autopilot with a trajectory of into the side of a mountain.” No problem on the mention, I thought it was the perfect opportunity :D.
This page contains content for which I may receive or have received compensation.